So Lonely in Gorgeous: Versatile Blogger Award Squared! 1. Nominate 15 fellow bloggers who are relatively new to blog. I'm sorry but I have to add two more bloggers to this list Yuli from http://www.yuliconversations.blogspot.com and Chelise from http://empirestatebeautyqueen.blogspot.com. You ladies are just gorgeous!!! 1. Although I love Mexican food I hate Cilantro...POISON! 2. At one time I had fourteen ferrets and they had their own bedroom. 3. I used to work for Cirque du Soleil. 5. My natural hair is VERY curly. 6. I'm a huge math and history nerd! I LOVE math and still do problems for fun. Also, I love watching the history channel. 4. Thank the person that nominated you. 5. 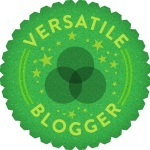 Add the Versatile Blogger Award picture in your post. Here's a photo of me when I had my brow piercings. Your welcome sugar :) Yeah, working with Cirque was an great time. What's your favorite show? Doing the happy dance ♪♫♪♫♪ thanks for awarding me again :) and congratulations to you. I really ♥ your bloggy. Thank you very much! I really needed it today to make me happy. Hi again! I just wanted you to know I wrote the post about the award. Congrats on both of your awards, well deserved! Thanks so much for passing one on to me as well! Thank you so much for the award! ::hugs:: By the way, I totally agree with fact #1, I also LOVE Mexican food but can't stand cilantro! Big hug back! I'm glad I'm not alone one the cilantro. Thank you so much!!! Congrats to you too!! !